The Bible end times are here! And we are living right before the second coming of Christ Jesus, when He will burst upon this world in glory with all His holy angels. It is our hope that you have come here today looking for the truth about the end times and Bible prophecy. Today we are living in a time like no other! The scoffers can mock all they like about earthquakes, wars and famine being with us for hundreds of years. But the fact of the matter is, if you take into account ALL the signs, you will see we are living in a time like no other before us! Are you ready? Friend, this is a very important hour we live in. Satan has come down with "great power and fury" and we MUST strive hard to press on into the Kingdom of God. We have a mighty foe to battle with, but an even MIGHTIER protector in Christ Jesus to help us! If we fix our eyes firmly on the present truth and have our hope cast WITHIN the Most Holy Place where Christ Jesus now resides, judging the world, then any winds of false doctrine and error will not move us. We will not be moved by worldly excitement and false revivals because we have followed our Master, Teacher, Saviour and Friend into the Most Holy Place in the heavenly sanctuary, where His people are being judged right now (1 Peter 4:17). This is a solemn time of soul searching and turning away from sin. Are you ready to stand before a Holy God?. The Bible truth can be hard to find today in these end times, because it is being trampled down and replaced with lies by satan and his followers, which has caused a "falling away" from the Bible truth since the early Church, which Paul spoke about in 2 Thessalonians 2:3 ...'Let no man deceive you by any means: for that day shall not come, except there come a falling away first, and that man of sin be revealed.' ... Through this gradual "falling away" many Christians have lost touch with the truth of God's Word in the Bible and have accepted false end times prophecy teachings, which is why we are here to shine that true light again. Are you preparing yourself for the end time trial that is to fall upon the people of God, and to meet your coming Lord and Saviour? Are you watching for the signs of the times and studying Bible prophecy? I hope so, because time is running out and we need to be prepared! There are many things happening in this world now that point us to the Bible end times, and Bible prophecy has always been fulfilled to the exact detail in God's Word. The beast of Revelation 13 (Roman Catholic Church) is gaining more and more power. The image of the beast is being setup in America, and the mark of the beast will soon follow, and on top of that, the morals of people are degenerating to the same degree as Sodom, just before God destroyed that city. Is it important for us to seek the truth and to live according to it? ... John 17:17 ...'Sanctify them through Thy truth, Thy word is truth.' ... Yes! It is through the truth of God's Word that we grow in our spiritual lives and draw closer to God. Especially in these last days we need to be urgently seeking the truth and living according to it. So search through this site to find out some amazing Bible prophecy truths. How do you know you will find the truth here? Because we only use the Word of God and actual historical facts. Is it important to study and find out the Bible truth about end times prophecy? Well, if you take a look at a prophecy that Jesus spoke Himself in Matthew 24:15-16 about the abomination of desolation and telling those who are in Judea to flee to the mountains, you can see how important it is. This prophecy of Jesus was fulfilled in AD70 when Jerusalem was burned to the ground by the Romans. The Christians, when they saw the Roman army come against the city remembered and kept this prophecy of Jesus and fled to the mountains where they were safe. And yet over 1 MILLION Jews did not heed the warning and lost their lives in the siege. Friend, Jesus gives us the prophecies so that we can be prepared for what is coming. So the answer to the question is, end time Bible prophecy is VERY important. All professing Christians should be diligently and prayerfully studying the Word daily, especially as we get near the end of time ... Acts 17:11 ...'These were more noble than those in Thessalonica, in that they received the word with all readiness of mind, and searched the scriptures daily, whether those things were so.' ... This is what we true Christians should be doing. Especially in these end times, we should be receiving the Word with eager hearts and searching the Bible 'daily', to make sure we are on the right path. How will we know if we are living in the Bible end times, if we don't study the Word of God? How will we know what the mark of the beast is if we don't study? This is so important! How will you know if you're being deceived if you don't study the Bible and seek after the truth? The whole point of being deceived is that you won't know about it! Satan is doing all he can to water down the truth of God's Word, and to stop people from studying and learning about the end times. ... Revelation 1:3 ...'Blessed is he that readeth, and they that hear the words of this prophecy, and keep those things which are written therein: for the time is at hand.' ... The book of Revelation reveals we will get a blessing by studying Bible prophecy and by keeping those things which it reveals. Bible prophecy is the "revelation of Jesus Christ"
This ministry is dedicated to touching your heart with the truth of God's Word. Satan is using all of the power he can muster to confuse and water down God's truth in the Bible, but God has always had a remnant throughout history who stand up for the truth no matter what pressure they are put under from the world. 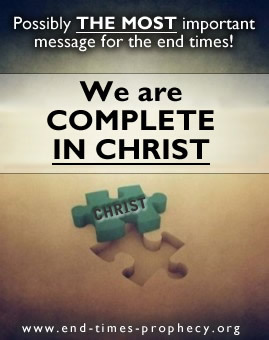 This truth needs to be proclaimed even more clearly and loudly as we are living in the last days, approaching the soon return of our Lord, King and Saviour Jesus Christ. Will you join us in standing up for the truth in the end times?